En ce moment, il n’y a plus de pilote dans l’avion. [At the moment, there is no longer a pilot on the plane.] — A European comment on President Obama as a leader of the Free World. TedLipien.com, Truckee, California, USA, January 03, 2011 — Who is the leader of the Free World when democracy is under threat? For a moment on New Year’s Eve 2010, I thought the leader of the free world was still George W. Bush. The President of the United States reads a message of solidarity with the people of Belarus, whose rights and freedoms have been once again trampled by an authoritarian ruler. Except that those reading the message were a former U.S President and a former U.S. Secretary of State, both Republicans. 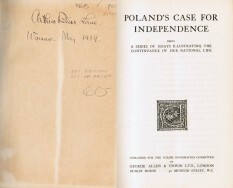 They were joined other world leaders, former statesmen, and human rights activists — courageous individuals like former Czech President Vaclav Havel, human rights activist Yelena Bonner, the widow of Soviet-era dissident Andrei Sakharov, Polish Foreign Minister Radoslaw Sikorski, Czech Foreign Minister Karel Schwarzenberg, and many others. 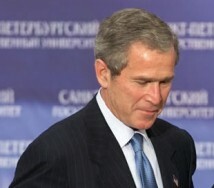 Former President Bush read the names of five Belarusian presidential candidates still being held in a KGB prison. The other participants read the names of other political prisoners in Belarus. But there was no high-ranking member of the Obama administration among the participants in the “Voices of Solidarity” project. Most Americans and millions in the rest of the world expect the President of the United States to speak up forcefully when democracy abroad is under major attack. When shortly before Christmas 1981, General Wojciech Jaruzelski imposed martial law in Poland, there was not a slightest doubt that President Reagan would appear in front of television cameras to express the support of the American people for the Polish independent trade union movement Solidarity and its imprisoned leader Lech Walesa. In the last weeks of 2010, few expected President Obama to act forcefully and effectively in face of yet another attack against freedom and democracy in Belarus. Both attacks on democracy supporters happened during a holiday season. 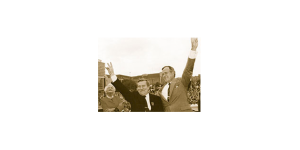 President Reagan, who was in 1981 much older than President Obama is now, had showed remarkable energy, determination, and leadership in letting the world know what the United States thought about a communist dictator like General Jaruzelski. Much younger Barack Obama left Washington for a family vacation in Hawaii. When elections in Belarus were stolen and democracy supporters beaten and imprisoned just before Christmas 2010, the White House issued a short written statement. Granted, the severity of repression in Belarus now has not reached the same level as in Poland in 1981, but presidential leadership in the U.S. was still woefully and significantly inadequate. Secretary of State Hillary Rodham Clinton and European Union High Representative Catherine Ashton issued a statement on the post-presidential elections situation in Belarus. It was short and, as the title suggests, without much bite. Again, it does not compare in any way to President Reagan’s numerous statements and speeches after the imposition of martial law in Poland. 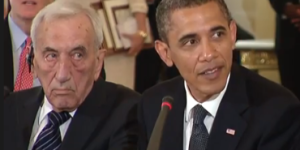 If you cannot see the video of President Obama’s Christmas 2010 address, click here. President Reagan with Pope John Paul II in Fairbanks, Alaska, 1984. 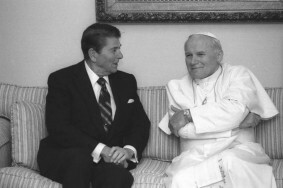 In his numerous efforts to help Solidarity, President Ronald Reagan consulted with Pope John Paul II. One could presume it was yet another of President Obama’s public diplomacy blunders, but unfortunately it is much more than that. This and other acts and omissions reflect his deliberate decision, taken at the outset of his presidency, to give up for all practical purposes the role of the leader of the Free World. After two years, it is now obvious that President Obama assumed the office determined not to upset totalitarian dictators. Operating under the illusion that by avoiding an overly confrontational posture he’ll be able to negotiate concessions and help them to reform later, he has emboldened dictators and insulted numerous loyal U.S. allies. Former Solidarity Leader, Nobel Peace Prize Laureate and former Polish President Lech Walesa. Many, especially those who had lived or still live under communist and other totalitarian and authoritarian regimes, knew perfectly well that this approach would result in a retreat for democracy. Vaclav Havel, Lech Walesa, and other leaders in East-Central Europe even sent a warning letter to the White House early into the Obama presidency. Still some pro-democracy and human rights activists, especially in Western Europe, were initially impressed with his soft power diplomacy as a welcome alternative to military interventionism of George W. Bush. Granted, President Obama has not started any new costly and unnecessary wars, but a series of public diplomacy disasters over the last two years, culminating in his weak response to repression in Belarus just before Christmas 2010, have exposed him at home and abroad as an ineffective U.S leader. President Obama’s public diplomacy strategy stems from his view of America as a threatening power, a popular theme among his left-wing friends and among revisionist academics who became his advisers on Russia and the Middle East. 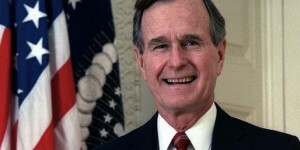 I became concerned that U.S. public diplomacy under his presidency was in crisis when not a single U.S. diplomat or any other official was able to advise him that announcing his unilateral decision to end George Bush’s anti-missile program in Central Europe on the day of the anniversary of the Soviet invasion of Poland would be received by the Poles as an ultimate insult. When President Obama finally received Dalai Lama, the media released a photograph showing the Tibetan spiritual leader being ushered out of the White House by a side entrance, passing by a pile of trash bags. It was yet another example that no one in the administration was in charge of public diplomacy. The answer to wielding influence abroad in defense of democracy is not blind, uninformed military interventionism of George W. Bush being pushed into war by advisers with a hidden agenda, but neither is it “resetting” of relations with ex-KGB spies and other opponents of democracy. President Obama could learn a lot from the leadership style of Ronald Reagan, who knew what he stood for and knew how to select and control his advisers and communicate his message to the American people and the world. But to be like Reagan, President Obama would have to first change his political philosophy and his vision of America. I don’t think that is likely to happen. It is fairly clear by now that the Free World will have to wait for a new leader until the end of President Obama’s presidency. That role cannot be assumed by George W. Bush or Senator John McCain. Only the President of the United States, as the elected leader of the most powerful nation in the world, can assume this role, but only if he wants to. It is now obvious that President Obama does not want that role. In fact, he is ashamed of it, as he has demonstrated many times, delighting dictators and instilling fear among U.S. allies. 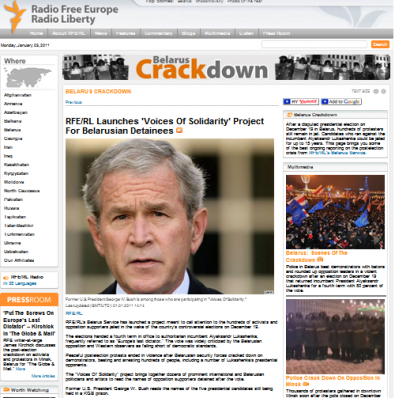 Snapshot from RFE/RL Website, January 02, 2010. It’s a shame that public diplomacy on behalf of the American people, American values, and America’s long-term interests around the world is now being conducted not by the administration but has to be pursued by former U.S. leaders like George W. Bush, who is not particularly popular abroad. But if President Obama won’t find time to become a public voice in support of freedom, at least the former president has shown what many Americans think and that demonstrated that they won’t be silent when democracy abroad is in danger even if the current occupant of the White House prefers to stay on the sidelines. Interestingly, the initiative of conducting U.S. public diplomacy in defense of freedom has been taken up also by the U.S.-funded broadcaster Radio Free Europe/Radio Liberty (RFE/RL), which had played a major role in helping to bring down the communist system. I have been in the past critical of RFE/RL, especially its treatment of its own journalists, but many of these policies had been imposed on the station by former members of the Broadcasting Board of Governors (BBG) and the BBG’s executives in Washington, D.C. Under the leadership of Bush-era appointed president Jeff Gedmin, RFE/RL has been trying to fill the gap created by the lack of a long-term U.S. public diplomacy strategy in East-Central Europe. RFE/RL has been broadcasting messages of support for the people of Belarus and providing news about the struggle for democracy to a number of countries in Eurasia. Unfortunately, without a high-profile support from the White House and the State Department, RFE/RL’s work will never have the same impact as it had during the Cold War. If anything, it further demonstrates the crisis of U.S. public diplomacy by sending a message that any change in American human rights policy and in relations with the countries of East-Central Europe will not come until the end of the Obama presidency. At least, RFE/RL is making it clear to its audiences that not all Americans agree with President Obama and his vision of America and the world. Still it is unfortunate that practically the only voice on behalf of the majority of the American citizens who had voted against the Democratic Party in November 2010 and indirectly voiced their opposition not only to President Obama’s economic policies but also his foreign policy, is a radio station which is practically unknown to most Americans. Although it is funded by the U.S. Congress, RFE/RL is based in the Czech Republic and most of its employees are foreign journalists who have never been to the United States. RFE/RL’s primary role has always been to serve as a surrogate domestic radio in the countries to which they broadcast. The role of explaining U.S. foreign policy and any opposition to it among Americans has always been assigned to the Voice of America, another U.S. government-funded international broadcaster which is based in Washington, D.C. and managed by the same U.S. Federal agency, the Broadcasting Board of Governors. 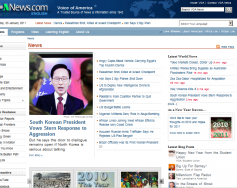 Snapshot of VOA English Service Website on Jan. 02, 2011. Yet it appears from a quick review of its English and Russian websites that the Voice of America did not even report on the RFE/RL’s Belarus initiative or the fact that George W. Bush and Condoleezza Rice participated in it as the most prominent Americans. A search for “Bush, Belarus, and RFE/RL” on the VOA websites did not return any results. If these two stations, working under the same BBG management, cannot consult with one another, it’s rather obvious that no one in Washington is in charge of coordinating public diplomacy and international broadcasting. What a big difference compared to Christmas time in 1981 during Ronald Reagan’s presidency, when I received numerous phone calls at home late at night from officials of the now defunct United States Information Agency (USIA) who wanted to know what kind of assistance the Voice of America’s Polish Service, where I was a managing editor, needed to expand immediately its medium wave and shortwave radio broadcasts to Poland. The Voice of America has not had any programs in Belarusian. It used to broadcast, however, radio programs in Russian, a language which is widely understood in Belarus. What made VOA largely ineffective in East-Central Europe was the BBG ‘s decision to terminate Russian radio programs in 2008, just 12 days before the Russian military attack on Georgia. The BBG also ended all VOA programs in Central European languages. The VOA English Service in the meantime has been broadcasting numerous news reports in support of President Obama’s “reset” policy with the Kremlin with very little balancing input from Republican lawmakers and other responsible critics of the administration — a legal requirement for VOA journalists under the VOA Charter approved by the U.S. Congress and signed into law by President Gerald Ford. One particularly one-sided VOA English Service analysis of U.S.-Russian relations, which completely ignored any Congressional and other U.S. criticism of President Obama’s approach to managing relations with the Kremlin, was first broadcast in English and then translated and put on the VOA Russian website. It was also translated by other VOA language services which lack resources to originate their own, more balanced reporting. And while democracy supporters in Belarus were still being rounded up and independent media outlets raided by the secret police, VOA and BBG officials issued a self-congratulatory press release bragging about VOA’s ability to communicate with the audience in Belarus through the Internet and social media. They failed to mention that social media sites were blocked in Belarus by the regime during the contested elections and the violence that followed. They also failed to note that Internet access in Belarus is still very limited, and that the number of visitors from Belarus to the VOA Russian Service website, if they even can be accurately counted, is statistically insignificant. Only a few days after the issuing of the deceptive press release, there was nothing left on VOA Russian Service website home page Sunday to indicate that Belarus was still a significant U.S. foreign policy concern. In fact, there was not a single news item on Belarus. Neither VOA Russian or VOA English home page features any banners with a link to more coverage of dramatic events in Belarus — something human rights defenders would certainly welcome. The State Department website, state.gov, when I checked it on Sunday, January 2, had nothing on its home page on Belarus. Another State Department website, America.gov, had on its home page only one link to the statement on presidential elections in Belarusdelivered by the charge d’affairs of the United States Mission to the OSCE. Again, it was short and without any bite: “The United States has made clear throughout its engagement with the government of Belarus that the government’s respect for human rights and the democratic process is at the center of our bilateral relations. The actions taken by Belarusian authorities following the elections represent a clear step backwards on these issues.” There were no “Solidarity with Belarus” banners of any kind on the State Department websites, but then U.S. diplomats should not be expected to do anything that President Obama and Secretary of State Hillary Clinton would not want them to do. The example has to come from the top. 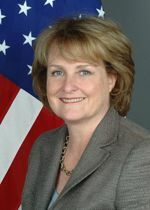 The Under Secretary for Public Diplomacy and Public Affairs, who — according to the State Department website — “leads America’s public diplomacy outreach, which includes communications with international audiences,” is Judith McHale, appointed to this position by President Obama. But one could also say in her defense that nothing she did not do President Obama really wanted to be done. 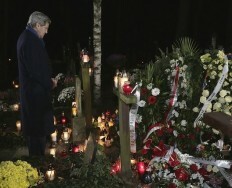 He certainly did not show much interest himself in the tragic events in Belarus. State Department officials are pursuing his public diplomacy, not necessarily public diplomacy serving long-term U.S. interests. 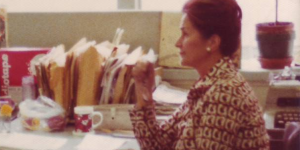 In 1981, VOA Polish Service did not have a website, but millions listening to our radio programs knew that the United States was fully behind the people of Poland. But then there was also no doubt what President Reagan, the White House, and the State Department stood for. During Ronald Reagan’s presidency, U.S. public diplomacy had a powerful message in support of freedom, and U.S. international broadcasting played its journalistic role of reporting on it. While I can understand that VOA English and Russian services cannot report on something that the Obama White House and the State Department are NOT doing to keep Belarus in the news, they could at least report more on what others outside of the administration have been doing to draw attention to the violations of human rights which continue everyday, even when U.S. officials and many VOA and BBG managers are on a holiday vacation. In light of all these developments, the initiative of Radio Free Europe/Radio Liberty to broadcast the message to Belarus from former President George W. Bush and former Secretary of State Condoleezza Rice is highly commendable. It’s vastly better than the totally ineffective public diplomacy outreach to Belarus from the Obama administration. Let’s hope that RFE/RL’s creative initiative will do some good, especially when Bush and Rice are heard alongside of many non-American statesmen and human rights activists. But the participation of George W. Bush and the prominent placement of his photo on the RFE/RL’s website — but not on the VOA website — also send another powerful public diplomacy message, and not a very good one: the pilot of the Free World is still missing from the plane. The people in Belarus and in other countries under dictatorships are justified in asking who will be leading America in its support for human rights and democracy for the next two years. Unfortunately, they have already concluded, that it is not going to be President Obama. We should be grateful that we still have Radio Free Europe/Radio Liberty and Americans like George W. Bush and Condoleezza Rice, but these are not U.S. institutions and leaders who can have the greatest possible impact on public opinion abroad. The leadership in support of democracy has to come from the President and the White House to be taken seriously by dictators and authoritarian rulers like Russia’s ex-KGB spy Vladimir Putin. That type of leadership has been missing for the last two years. 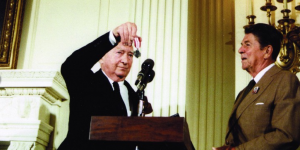 As a former United States Information Agency and Voice of America employee with over 30 years of U.S. government service, my unofficial and subversive — from the perspective of the current White House and the State Department — public diplomacy message for foreign audiences is that President Reagan’s response to events in Poland in 1981 was much more typical for what most American’s would want now than President Obama’s practical non-response to the assault on democracy and human rights in Belarus. Another unofficial public diplomacy message — again for what it’s worth since I have absolutely no current connection to the administration — is that President Obama’s foreign policy should not be always identified with the desires of the American people. In other words, democracy supporters abroad should not blame the American people and the United States for President Obama’s weak support for human rights. It is also worth remembering, especially in light of the results of the 2010 U.S. Congressional elections, that Barack Obama may no longer be president in 2013 and that American voters may soon help bring U.S. foreign policy back on its more traditional course. Ted Lipien is a former Voice of America acting associate director. He was also a regional BBG media marketing manager responsible for placement of U.S. government-funded radio and TV programs on stations in Russia, Bosnia, Afghanistan, Iraq and other countries in Eurasia. 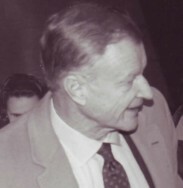 In the 1980′s he was in charge of VOA radio broadcasts to Poland during the communist regime’s crackdown on the Solidarity labor union and oversaw the development of VOA television news programs to Ukraine and Russia. After leaving U.S. government service, he founded Free Media Online (FreeMediaOnline.org), a California-based NGO which supports media freedom worldwide. He is also author of “Wojtyla’s Women: How They Shaped the Life of Pope John Paul II and Changed the Catholic Church”(O-Books – June 2008). The book, which describes Pope John Paul II’s views on feminism, also includes evidence of the importance of Western radio broadcasts during Karol Wojtyla’s life in communist-ruled Poland and in the first ten years of his papacy. The book also has references to the efforts of the KGB and other communist intelligence services to place spies in the Vatican and to influence reporting by journalists covering the Polish pope. This commentary by Ted Lipien may be republished in full or in part with attribution to FreeMediaOnline.org.